7, Jalan Balakong Jaya 1, Taman Industri Balakong Jaya, 43300 Balakong, Selangor, Malaysia. 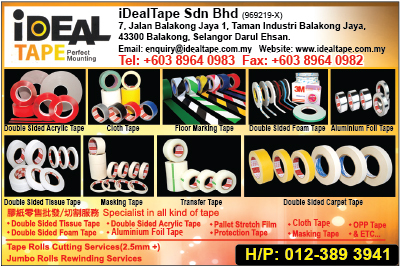 IDEALTAPE SDN BHD is one of the leading self-adhesive tape manufacturer and importer in Malaysia with converting facilities. you can trust us to provide you with reliable and quality products and excellent services with competitive pricing. We supply a wide range of products for industrial application and and we emphasis on consistence in quality, service and cost effectiveness. Categories include adhesive tapes, packaging material, masking, protective tapes and label products. We can even create custom tape designs with logos, varied colours and different materials. Consistently meeting or exceeding our client’s expectation on product quality and delivery performance. Promise to become a responsible suppliers on timely delivery of product and services to meet client’s requirement.